Dynamic phasing in the SmartMotor allows offsets in physical base while maintaining position counter and load on target. Since 2009, Burchfield Automation has been providing its Pan/Tilt systems commercially utilizing the specialized phase-offset adjustments that are now a standard programming feature in the SmartMotor. Its Pan/Tilt systems successfully use the phase-offset feature as a vibration dampening measure to create stabilization. The system uses two servo motors: one to compensate for elevation changes and the other for azimuth changes. The phase-offset adjustment creates a differential velocity between the external gyroscopic measurement of the Pan/Tilt system and the motor's internal encoder at a rate of up to 2MHz update speed. Phase-offset mode also allows arm-end effectors to remain parallel to the base while the mid-arm section moves. This allows the physical measurement of the gyroscopic position sensors to tie in directly to the closed loop of the servo, allowing for the highest degree of accuracy, smoothness, and precision, all while contained in a compact unit. In addition, the SmartMotor can run in any other mode, such as position, torque, or velocity, while the phase-offset feature is being used (with the exception of gearing and camming, because they use the external encoder input). Competitive pan and tilt or target tracking systems typically use worm gear reduction and open-loop steppers or DC brushed motors to save on total system cost. As a result, they lose the benefits of a true brushless closed-loop servo. Steppers often vibrate too much for steady targeting, causing targets at a distance to be difficult to track and leaving the end image shaky and unclear. Worm gear reduction has backlash, friction, and wear and tear issues that fall far short of harmonic gear reduction. Collectively, an integrated servo motor with a phase-offset feature, paired with a properly sized harmonic gear reducer, provides the stiffness and accuracy needed with closed-loop precision that outshines the competition and keeps you on target, literally. Utilizing this technology, Burchfield was able to achieve an impressive stabilization resolution of 0.1 degrees in heading, pitch, and roll directions and pointing accuracy on fixed platforms of 0.0083 degrees. 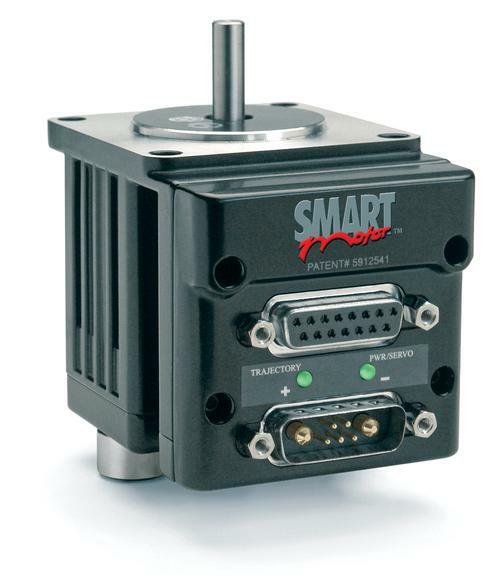 With the availability of multiple onboard I/Os programmable as inputs or outputs from 5–24V, the inclusion of an integrated servo (such as the SmartMotor) allowed for full machine development. The result is a camera that can lock on to a target and hold it in focus regardless of vehicle movement. Hack Summer is Director of Application Technology at Animatics Corp.